The men's varsity crew teams competed at the 50-Year Celebration at Cayuga Inlet on April 28. 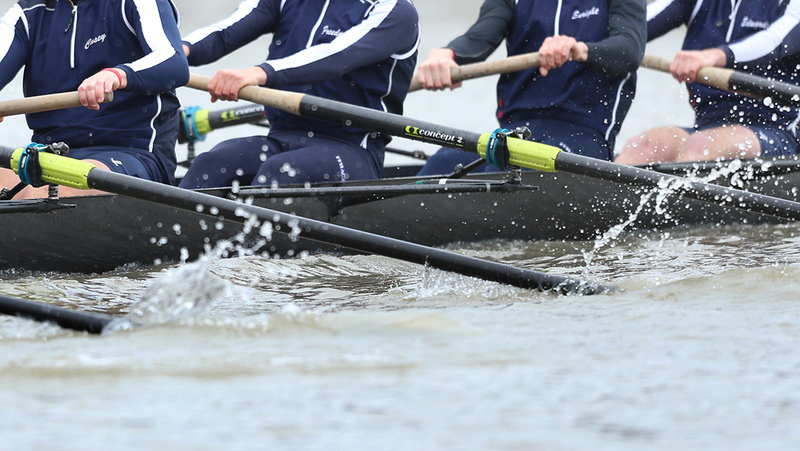 The Ithaca College crew teams competed in the 50-Year Celebration against Marist College, Colgate University and Hamilton College on April 28 at Cayuga Inlet. The women’s team won four races on the day. The first one was by the women’s Varsity 8 boat, which topped Hamilton. The Blue and Gold raced 6:38.5 while Hamilton’s boat finished with a time of 6:48.8. In the next race, the Second Varsity 8 defeated Hamilton by racing to a time of 7:04.4 while Hamilton raced to a time of 7:04.5. The women’s Novice 8 boat raced to a time of 7:33.0, while Hamilton’s boat fell behind and finished with a time of 7:58.5. In the last race of the day, the Varsity 8 raced again, but this time against Marist. The South Hill squad finished the race with a time of 6:33.4 while Marist finished with a time of 6:36.5. In the first race of the day for the men’s team, the Varsity 8 boat lost to Hamilton. The Bombers raced to a time of 6:04.92 while Hamilton finished with a time of 6:02.96. The Varsity 8 boat rowed later in the day against Colgate with a time of 6:07.9, but Colgate finished with a time of 5:47.9. The college’s novice boat fell to Hamilton’s second Varsity 8 boat, rowing to a time of 6:32.76 while Hamilton rowed a 6:22.97. In the men’s Varsity 4 race, Colgate came out on top to beat the Blue and Gold. Colgate raced to a time of 7:08.34 while the South Hill squad finished with a time of 7:20.73. In the final men’s race of the day, Hamilton edged out the Bombers’ Novice 4 boat with a time of 7:21.44. The Blue and Gold raced to a time of 7:28.44. The college will face off in the Liberty League Conference Championships at 4 p.m. May 4 in Saratoga Springs, New York.